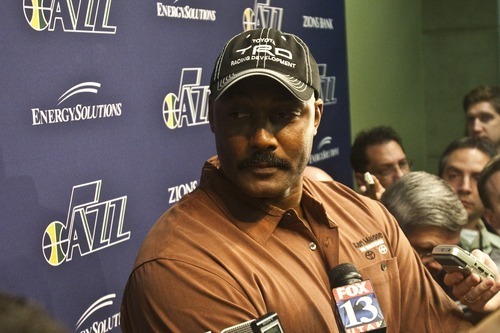 Rumor is that Karl Malone is running "The Amazing Race"
Photo by Chris Detrick | The Salt Lake Tribune Karl Malone talks to members of the media at EnergySolutions Arena Friday February 11, 2011. Realityfanforum.com is reporting ... well, speculating ... that former Utah Jazz all-star Karl Malone and his wife, Kay, are contestants in the upcoming season of "The Amazing Race." There's no confirmation on this, because CBS will neither confirm nor deny anything about upcoming seasons of "The Amazing Race." The network doesn't even announce who the contestants are on this reality/competition show about a race around the world until shortly before a season begins. And the next season doesn't begin until September. The show is, however, in production. And reports like this crop up every year because racers are spotted in airports or something like that. If they're familiar faces, word leaks out. What with Malone being Malone  all 6-foot-9, 265 pounds of him  he'd be recognizable in an airport. We don't even know if the Mailman is actually on the show, but there's already skepticism about whether he can win. After all, Malone has never been able to deliver a championship before. And "The Amazing Race" airs on Sundays. Remember what Scottie Pippen said during the 1997 NBA Finals  "The Mailman doesn't deliver on Sundays."